Doggy Daycare is fabulous option for working dog parents who don’t have enough time to tire their dogs out. However, not all doggie daycares are created equal! This article will tell you the main things to look for in a doggy daycare so you can make an educated decision about where your dog will be spending her days. What is the screening process for dogs? Working at a doggy daycare is far from playing with puppies all day. Not only are you constantly cleaning up after the dogs, but you must have a watchful eye for dog body language. Properly trained daycare attendants will be able to spot potential problems long before they start. This is not something that can be learned quickly. As your dog’s guardian, you will want to understand the training process the staff had to go through so you feel safe putting your dog in their hands for the day. What enrichment opportunities are offered to the dogs? Does the staff have interactive play with the dogs? Are the actively tiring the dogs out with games such as fetch or are they just letting the dogs figure things out on their own? Are there toys in the space that the dogs can play in and around? Dogs enjoy chasing each other around things – think of it as hide and seek. Does the daycare offer this as an option to the dogs? What is the daycare’s policy on intact dogs? If they don’t have a policy, run far, far away! At the bare minimum, the policy should be that no females in heat are allowed in the building. What is the daycare’s emergency plan? There are a lot of emergencies that could happen so it’s critical that your chosen daycare have a plan. If it’s a building-wide emergency, do they have a way to contact owners? (Such as in the case of a fire) If it’s a dog-specific emergency, do they know where the closest vet is and who is going to take the dog there? Do they have a plan for how to contact you if this happens? Ideally, their application will have covered a lot of the dog-specific emergencies including, but not limited to, permission for a certain level of care without your prior approval, known allergies, known health issues, etc. What is their cleanup routine? Dogs are dirty! They will be relieving themselves on the daycare floor or grass so it’s important to know how the staff cleans up after the dogs. Additionally, there should be a routine of deep cleans where everything is completely disinfected. Ask your potential daycare what they use, how often they use it, and what their deep clean routine is. If you ask all these questions to the various daycares you’re considering, you should be able to make a very informed decision about where to take your dog. Keep in mind that daycare is not a great fit for every dog so stay tuned for my article on daycare alternatives! 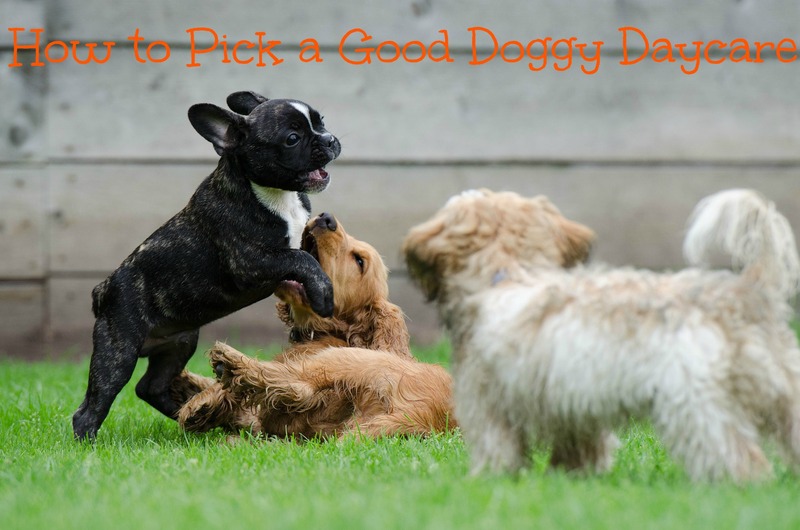 After reading this article, do you feel better equipped about how to pick a good doggy daycare? What other questions or scenarios have you encountered? ← Are You Sabotaging Your Dog? I had never considered the fact that employees at a doggy daycare need to constantly pick up after dogs as well as have an eye for their body language. My wife and I just bought a dachshund puppy but neither of us is available to watch him during the day. It may be beneficial for us to find a doggy daycare where we can keep him while we are at work. I loved your tip to ask about how trained employees are before you choose to leave your dog with the daycare. I am looking to find a daycare to take care of my dog libby while I am out at work. I will be sure to inquire about the employee training. My husband and I are wondering what dog daycare we should take our pet to when we’re at work. So I like your suggestion to find a facility that will be sure to clean and disinfect your puppy after they’re done playing. We will be sure to find a dog daycare that cleans up our dogs so that we won’t have to worry about taking home a dirty puppy. My family and I are going out of town and have been looking for a place to watch our dog. Your tip about determining the enrichment opportunities offered to dogs was very insightful. Do most places have a lot of things for them to do or do they just watch them? It seems finding the right place for our dog could be very beneficial for him. I think the best way to find one in your area would be to call around and interview various places. You may have the best luck with an in-home boarding situation, just be sure to check references to ensure they actually know what they’re doing!